I’ve noticed lately that my days seem to be having their own soundtracks. We’ve become a kind of soundtrack world, what with the abundant use of iTunes, the earbud generation and the incessant need to insert any type of sound into the hours. These are the playlists of our lives, what we exercise to, the music in the background while we work, what blasts from our computers as we clean, or cook or just manage the day. What I’ve been noticing is that each day seems to have it’s unique sound, a type of music that fits to the mood, weather and sense of self that we connect with through our waking hours. While most of us have our favorite music, I wonder how often we switch out the tunes in an attempt to match the feeling of a particular Friday, or a lazy Sunday afternoon or a bright shiny Wednesday morning. Rainy days have their own soundtrack, and sunshine makes music like nothing else. If you’re not sure what I’m talking about, just sit down with an old Warner Bros. cartoon medley, and see what I mean. The Disney animators of old knew exactly how to use music to create a wordless story, to set mood, to create action. Remember the original movie version of Fantasia? It was all about matching music to mood. Vivaldi’s Four Seasons, with it’s gentle Springtime lilt and angry Summer thunderstorm movements are a perfect example. I can’t ever listen to composer Paul Dukas’ famous orchestral work ‘The Sorceror’s Apprentice’ without seeing Mickey Mouse, flashing lights and thousands of brooms. Music sets the tone and starts the imagination, it inspires and ignites us. And food fits into the sense of every day, much the same as music. We all know those lustrous summer days that beg for a juicy grilled burger and corn that’s fresh from the field, the springtime air that makes you dream of salads, fresh peas and asparagus. Winter speaks like soup, or a hearty stew simmering in a pot and then there’s those days that nothing else will do besides a long slow fire and the smoke of a perfect BBQ. Rain and baking, as I recently discovered, sometimes are the best of friends. I love having music on when I’m elbow deep in the creative process in my kitchen. With iTunes radio, a huge selection is at my fingertips and with a few clicks I can have the perfect background to what I’m doing. I recently was faced with a rainy day that felt like it would perfectly match with soft cafe jazz, a warm oven and a pan of muffins to make it complete. Sitting at the top of my To Make pile on the counter, the place where inspiration lives with just a few shufflings of papers, was a recipe for Fig Muffins with Lemon Honey Cream cheese filling, and oh how that magically blended itself into the saxophone, the steady patter of spring rain outside the door and the gentle rhythm of mid-week. With a loaf of 10-grain bread from my dog-eared copy of ‘Healthy Bread in 5 Minutes’ and a steaming cup of tea, it was about as right and perfect as it could be to give chase to the gray sky. 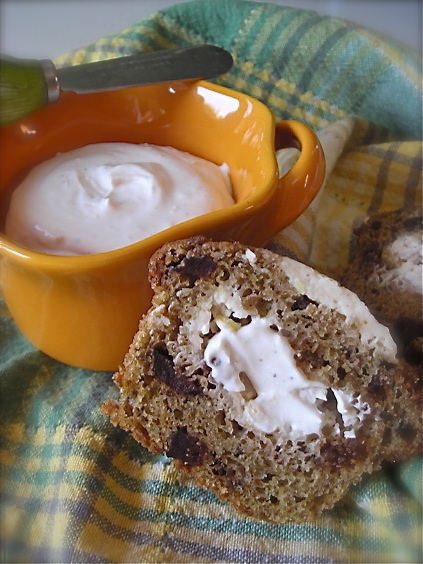 Of course, I am a bit head over heels for figs, so it likely didn’t hurt that one of my most favorite fruits was the superstar in this moist and tasty breakfast treat. But when you blend up a lovely fragrant batch of sweet honey and lemon flavored cream cheese and bake up these muffins with it’s delightful hidden center, the result alone may have been enough to push the clouds aside for a ray of sun to enter the house. Lemon is another true love I’ve found with baking. There’s something about the zesting and the juicing and the way the yellow oval resembles a bright July day that always makes me eager to place a few in my basket at the market. For me, the lemon scented cream cheese alone may be the path to a better day, with or without jazzy backdrop, whether it’s raining or not and I was so glad that I made the whole container into this fragrant mix. I will find ways to consume the leftovers. Like spreading it copiously all over these muffins, because I’ve discovered that with some food items, there simply can’t be enough of a good thing. What kind of soundtrack defines your days? Do you change up your music to suit your mood?? Preheat the oven to 400° and line two 6-count muffin pans with liners. You can use cooking spray too, if you like. In a small bowl, combine all ingredients and blend until smooth. Add more zest or juice if desired. I love a good tart flavor. 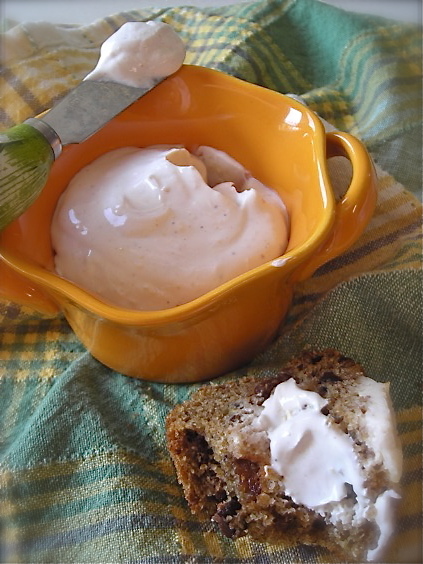 In a medium bowl, whisk together the flour, baking powder and soda, salt and ground flaxseed. In a separate bowl, combine the eggs, sugar, buttermilk and oil and whisk until blended and uniform. If you’re using turbinado, don’t worry if the sugar doesn’t dissolve fully, just whisk until blended. Mix the wet ingredients in with the dry and stir until just incorporated, then add the figs and gently fold together. Spoon batter into muffin cups to half full. 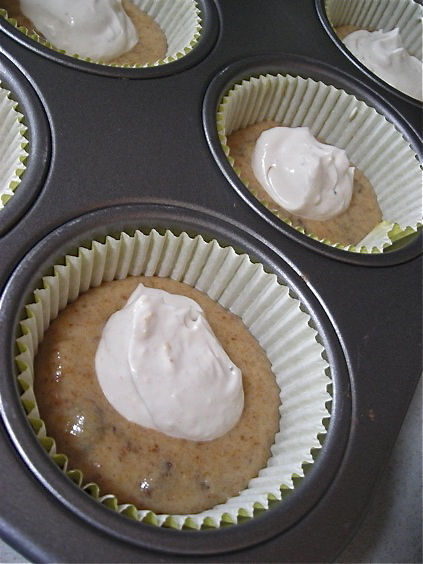 Add about a tablespoon of the cream cheese mixture to the center of each muffin, then cover with more batter. You shouldn’t see the filling, but don’t worry if you do. I spooned a smaller amount of cream cheese on to the tops of each muffin, but you don’t need to do that. Sprinkle the tops of the muffins with more turbinado sugar, or another sanding sugar if desired, then bake them for 13-15 minutes, or until they spring back when pressed. Allow the muffins to cool in the pan for 10 minutes, then take them out and allow to cool fully on cooling rack. It depends on soundtrack days. Sometimes, I do change my music to suit my mood. But others, some times I try to change my mood to suit my music! I made Dalmatian Cupcakes this weekend (chocolate cake with a cream cheese & mini chocolate chip surprise center and vanilla frosting with mini chocolate chips on top) for the first time & think my cream cheese was too soft to start – it was a bit runny once I added the other ingredients so it baked in more than staying a nice dollop in the center like your did above. They were still good – just not the way I intended. You inspire me! Those muffins look awesome & healthy too. I’m going to try those.